Happy Friday!! We hope you’re getting excited for the weekend. It’s supposed to be beautiful here in our corners of DC and NYC (hello 70s in late October!!) so we’re looking forward to spending some quality time outside playing in the leaves and taking advantage of being able to exercise outside without bundling up! To kick off the weekend, we’re sharing one of our most favorite pancake recipes. Because, don’t weekends and pancakes just go together? This recipe has a long history with us. It’s something that we developed years ago during a kitchen experiment. We wanted to make an oat-based pancake that didn’t have the texture of the whole oats in it (we love that texture but wanted more of a traditional pancake feel). The other aspects of this dream-pancake we were looking for was that it wouldn’t contain any processed flour, it would have protein, and it would…. provide a veggie serving. Somehow it happened on the first try and we kept re-testing it to see if it was a fluke. It’s not. This recipe is so easy (i.e. 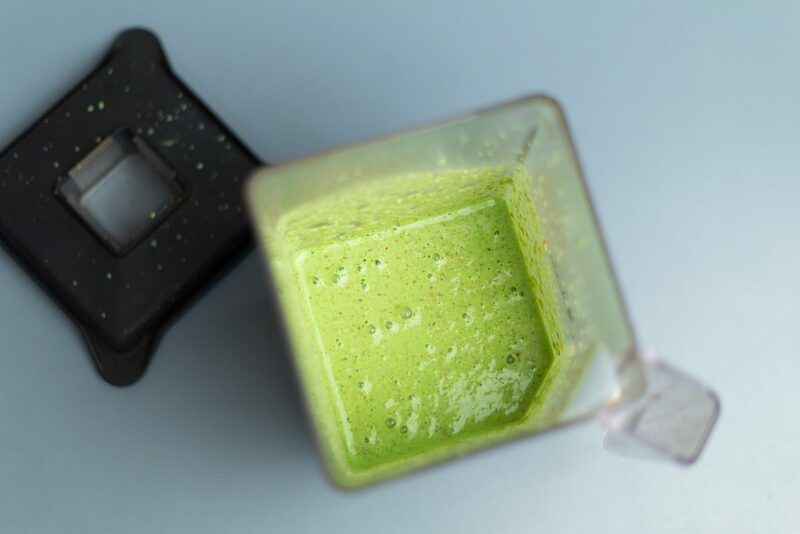 you toss all ingredients into the blender, blend until smooth, then cook as usual) and it’s become one of our favorites. Last year our good friend (and past roomie! shoutout to Leah!) from grad school told us that the recipe was one of her faves and she had shared it with friends and family. So, we figured it deserved its own blog post. We hope you love it as much as we do. P.S. The pancakes freeze well and also keep well in the fridge (the leftovers make delish pancake tacos, filled with nut butter and cacao nibs). Ready to blend into batter. 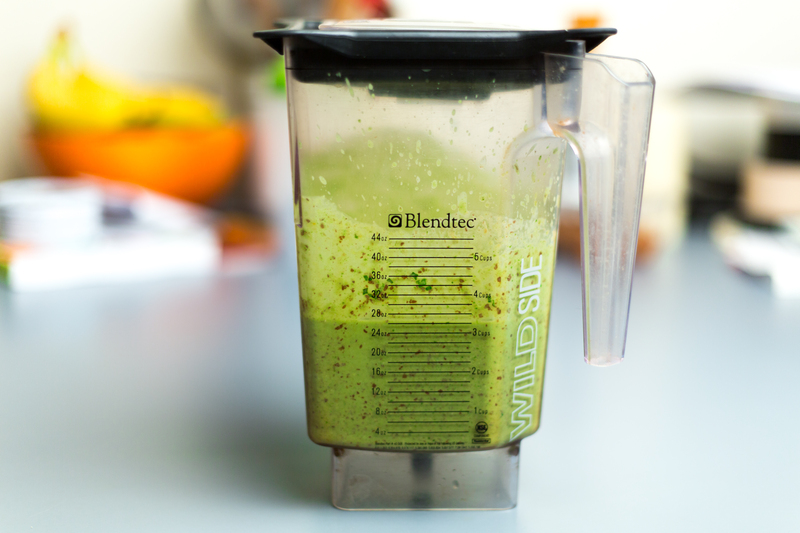 Once it’s blended, you’ve got some pretty awesome green batter. Then it’s time to turn that batter into pancakes. Top your stack with whatever you like. 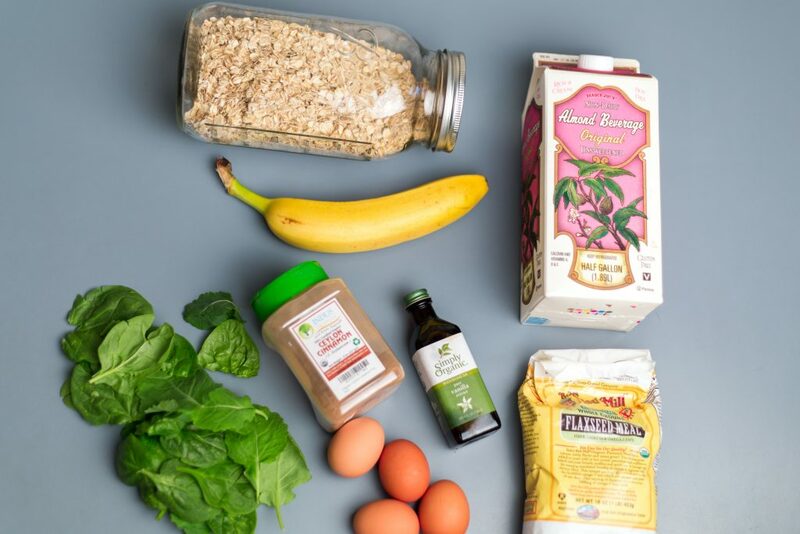 We love coconut yogurt, hemp seeds, banana, and maple syrup. Topped! Coconut yogurt, hemp seeds, and a drizzle of pure maple syrup. Other than being so darn tasty (and even kid approved… thanks C&J tot tester Juliette!) 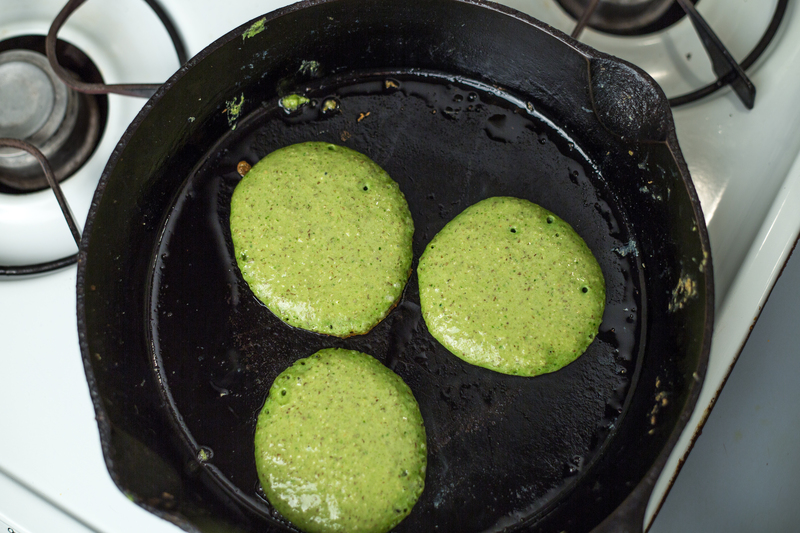 these pancakes offer the perfect balance in nutrients (protein, carb, and fat) thanks to using whole grain oats (healthy high-fiber carbs), flaxseeds (healthy fats and protein) and antioxidants (hello spinach!! ), which means they won’t leave you feeling weighed down like some traditional pancakes might. And in the spirit of Halloween on Monday, we challenge you to making these into little green ghosts or witches hats using cookie cutters… we may be trying that this weekend, too! 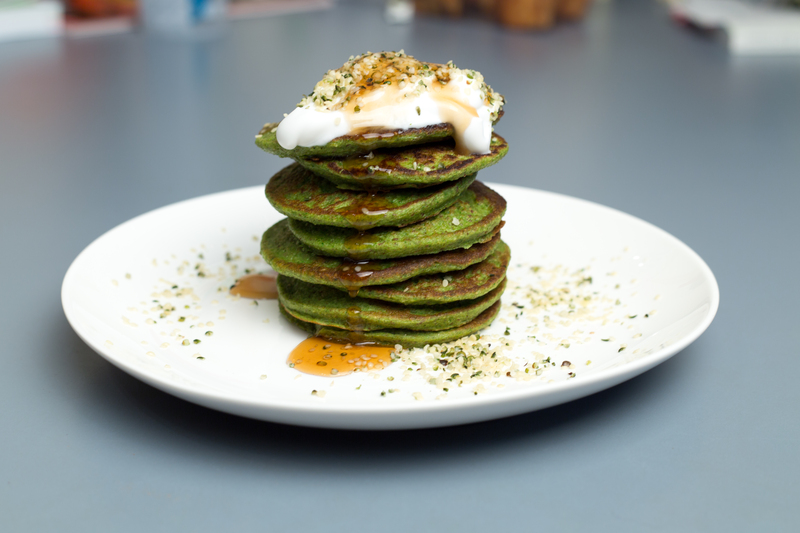 If you cook up these pancakes, let us know what you think! 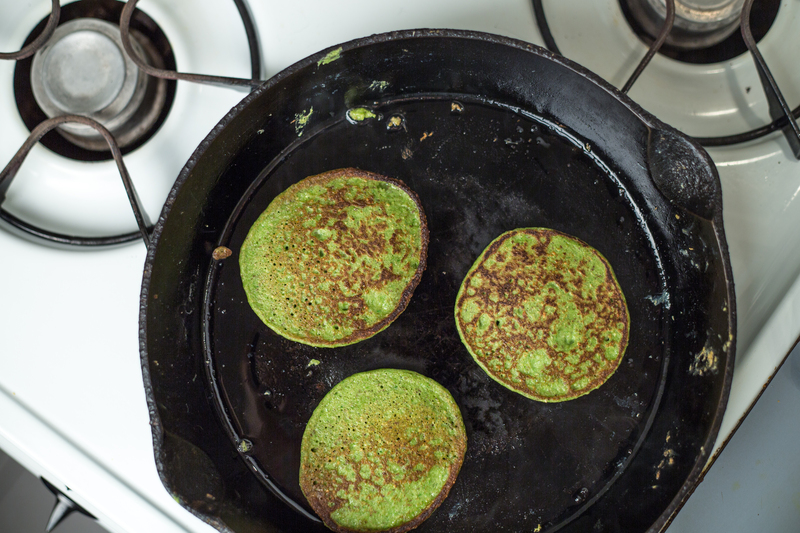 And share your #greenpancake snaps with us on Instagram @cjnutrition! These pancakes are light, fluffy, and have a hint of vanilla. Other than the awesome color, you would never guess there was spinach in them! 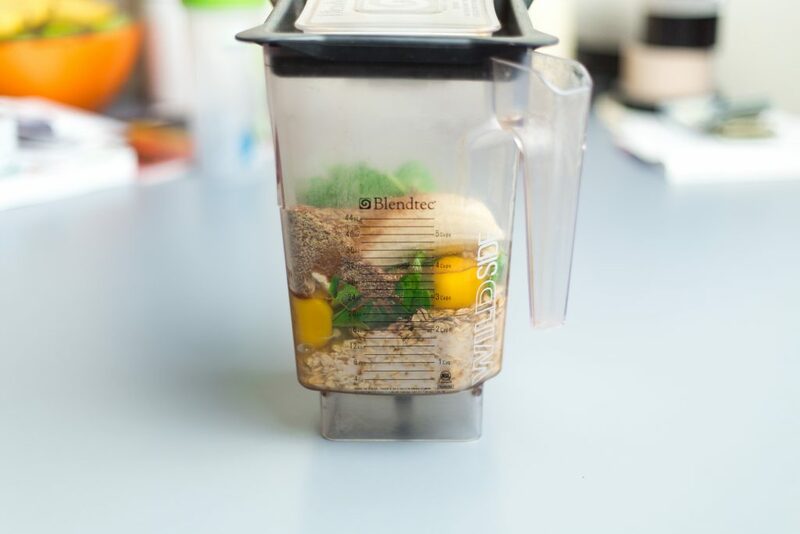 Blend all ingredients together in a blender until smooth, about 1 1/2-2 minutes. Let sit, covered, in the refrigerator for 15-20 minutes to thicken. In a skillet over medium heat, sprayed with olive or coconut oil, pour 1/3 cup batter into pan and cook until small bubbles form and don’t re-close. Flip and cook for an additional 2 minutes, or until cooked through. Repeat with all batter. Top finished pancakes with sliced banana, walnuts, yogurt, maple syrup, or any other toppings you love. CALORIES: 194, PROTEIN: 10g, FAT: 7g fat (1g saturated), CARBOHYDRATE: 26g, SODIUM: 117mg, CALCIUM:159mg, 93mg cholesterol. These are so pretty! I can see a new St. Paddy’s Day tradition here, but I won’t wait until then to try them. Let us know when you make them…and they would be perfect for St. Paddy’s Day! A plate of these would be a great way to start the day. We have a feeling that might be in your future! Hi – I can’t stand bananas and wonder what a good “swap” would be..? Hi! You could try cooked and mashed sweet potato or using a couple dates instead (you’d just need to blend the dates into the milk really well). Applesauce could also be a great sub for the banana. Will you let us know if you try any of these subs and how they turn out? OMG this looks like a delicious and nutritious recipe. Do you mind if I share this on Facebook to my followers? 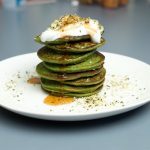 They’re health nuts and love these type of superfood recipes. Hi Jessica! So glad you are liking it. Please do, share!